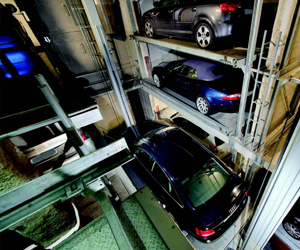 Robotic parking systems are a space-saving solution addressing the increase of vehicles and the decline in parking space in our cities. Installation requires the deployment of a complex vehicle transport and internal movement system susceptible to power outages, surges, etc. Faults in the machinery or parked vehicles can spread a fire, resulting in dire consequences for the structure and for other cars, which end up getting trapped as a result.